Education and equity advocates have much to celebrate in this budget, including additional dollars for our most vulnerable students. Despite this progress, changes made to the state assessment should be concerning to all Michigan students, parents and educators. Since early 2017, the governor and state legislature have been debating the state’s school aid budget for fiscal year 2017-18. The roughly $14 billion school aid budget is the primary source of public school funding in Michigan. As described in our March 2017 analysis of the Governor’s executive budget recommendation, the state budget provides important opportunities to advance equity and educational excellence. Money alone, however, will not improve our schools. As leading education states have shown, bringing about extraordinary improvement in student learning requires strategic investments in sustained, transformative and systemic changes. The final Michigan budget includes an increase of about $153 million in per-pupil funding, which amounts to an additional $60-$120 per student. The budget also adds $25 per pupil for high school (grades 9-12) operations, as these schools often have higher costs that elementary schools typically wouldn’t incur. Beyond this increase for schools and districts, the final budget also includes a significant increase in funds dedicated to addressing the additional needs of low-income and low-performing students—known as “at-risk” funding. These funds are provided in addition to per-pupil funding allocations. In one of the largest increases in recent years, the legislature has provided an additional $120 million to support the education of at-risk students. This brings total annual funding for at-risk students to nearly a half billion dollars. Finally, this budget invests in efforts to support the education of English learners and English proficiency – critical for the long-term success of recent immigrant students. In this budget, funding has increased from $1.2 million to $6 million. These proposed funding increases—particularly for our most vulnerable—are a positive step forward for Michigan’s public school students. See Table 1 on the next page for a breakdown of estimated funding increases from select Michigan school districts in fiscal year 2017-18. Quality assessments provide critical feedback on the impact of teaching on student learning and let parents know if their child is on track. They also ensure that all students are being held up to the same high expectations statewide. Created with the input of thousands of experts and educators over multiple years, Michigan’s adoption of the M-STEP assessment has for the first time provided a truly honest portrait of college- and career-readiness for Michigan students. 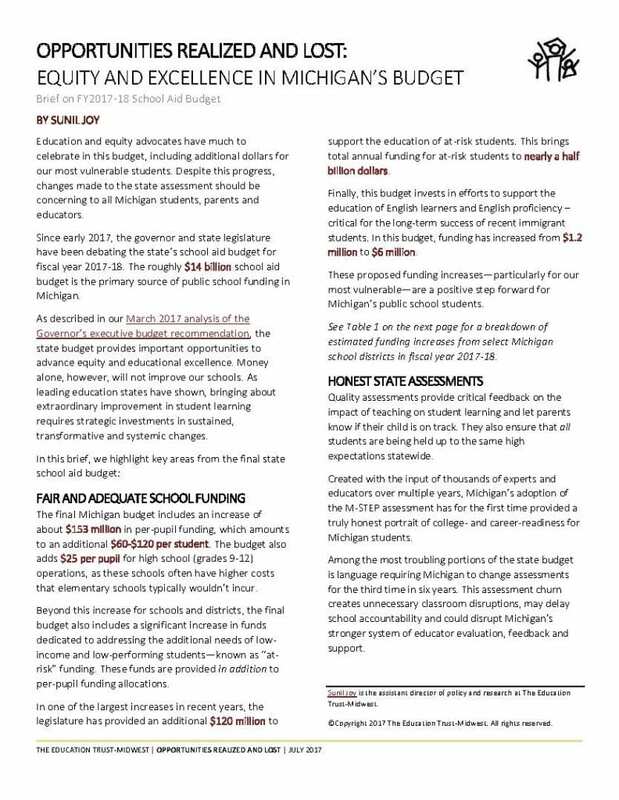 Among the most troubling portions of the state budget is language requiring Michigan to change assessments for the third time in six years. This assessment churn creates unnecessary classroom disruptions, may delay school accountability and could disrupt Michigan’s stronger system of educator evaluation, feedback and support. Research shows that the first few years of life are vital in a child’s development. In fact, by the time a child enters kindergarten, we already see massive gaps in vocabulary between low- and higher-income students. Research also shows that a child’s ability to read by third grade is an important indicator of whether that student will drop out of school, find regular employment or even end up incarcerated. The final budget continues the $243.9 million annual investment for the Great Start Readiness Program (GSRP), an initiative that provides preschool for low-income four-year olds statewide. The budget also increases funding for early literacy initiatives from $24.9 million to $30.4 million. Included in this increase is doubling funding for reading coaches, from $3 million to $6 million. Much of the remaining dollars are to be distributed to districts at an equal per-pupil amount of $210 per 1st grade student. While we support the state’s continued commitment to early literacy, we know that Michigan can’t succeed with a few one-off investments. It’s going to take a series of interconnected changes in both policy and practice over multiple years. These must be combined with a serious focus on quality implementation, careful monitoring of data, and a willingness to learn and recalibrate. When a school is identified as underperforming, school and district leaders must take proactive steps to address their deficits. It is essential that the district and school undergo a comprehensive needs assessment to address root causes—which must include the unique needs of their most vulnerable students. In the end, for the sake of all students and Michigan’s future vitality, these schools must be put on a long-term pathway for success. The budget includes $6 million for partnerships between the Michigan Department of Education and struggling school districts to support improvement. School and district improvement is hard work and it is critical that these dollars are closely monitored to ensure that low-performers are actually seeing results. Research consistently shows that teaching quality is the number one in-school predictor of student success. We are pleased to see the inclusion of $2.5 million to develop a quality statewide student growth model. Such growth models can also be used to generate student projection reports—a tool that can predict whether a student is on track to be successful in college-level courses from an early grade. In leading states like Tennessee, educators use rich data from these models to help support and inform their instruction. A full breakdown of funding increases by school district can be found here (see FY2017-18 District Impact Report).